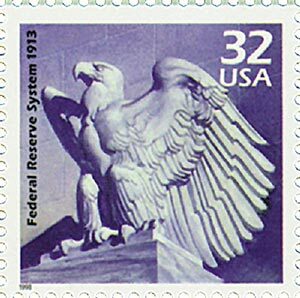 U.S. #3183b pictures an eagle statue on the Federal Reserve building. On December 23, 1913, President Woodrow Wilson signed the Federal Reserve Act, establishing America’s current central banking system. The idea of a central banking system dates back to post-Revolutionary War America. The new country had large wartime debts and needed a solid banking system. Two of America’s founding fathers and long-time friends, Alexander Hamilton and Thomas Jefferson, were split on the issue. Hamilton believed the U.S. should adopt a national bank, similar to European nations, but Jefferson thought that would threaten democracy. Jefferson also believed it would benefit the North but hurt the South, who received credit from local banks after the war. U.S. #1053 is generally considered one of the most beautiful U.S. portrait stamps of the 1900s. 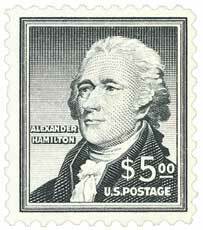 In the end, Hamilton won and the First Bank of the United States was established in 1791. Chartered for 20 years, the bank did successfully help the economy, but it failed to be renewed by one vote in 1811. The Second Bank of the United States was established in 1816, also for a period of 20 years. It was largely unpopular in the west and south, and became a private bank when its charter expired in 1836. For over 75 years, America didn’t have a central bank. During that time there were several financial panics that led some to believe that banking reform was needed. In 1912, the National Monetary Commission submitted the Aldrich Plan (named for its chairman, Nelson W. Aldrich), which called for the creation of a National Reserve Association. This association would provide emergency loans to member banks, produce money, and serve as the government’s fiscal agent. 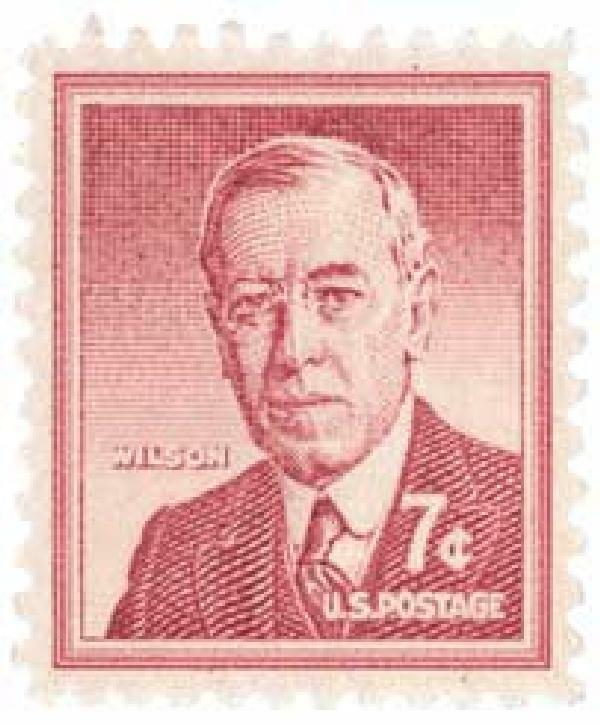 U.S. #1040 features a portrait of Wilson based on a drawing by F. Graham Cootes. During the election of 1912, Democratic candidate Woodrow Wilson included plans for banking and currency reform on his platform. After he was elected and entered the White House, he made this reform one of his top priorities. He sought to find a middle ground between the needs of the conservative Republicans and the left-wing Democrats. The act was introduced to the house in August 1913 and signed into law by President Wilson that December 23. The Federal Reserve Act of 1913 gave private banks control of the 12 regional Federal Reserve Banks, but placed controlling interest in a central board selected by the President, with Senate approval. The plan went into effect in 1915, later playing a major role in financing the Allied and American war efforts. The Federal Reserve Act set the framework and guidelines for the nation’s banks, credit, and money supply that we still use today. Commonly known as the “Fed,” this independent governmental agency manages the country’s supply of money and credit. The Fed also provides various financial services for the federal government and the banking system, and issues our paper money. 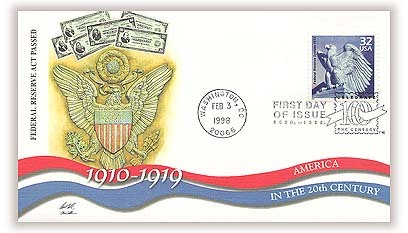 U.S. #3183b – 1998 Federal Reserve Act First Day Cover. Congress created the Fed to provide a flexible currency for the nation and to supervise the banking system. It controls the flow of money and credit in three ways: through open-market operations, the sale or purchase of government securities; by changing reserve requirements, the percentages of deposits that most banks must set aside before funds are made available for loans; and by changing the discount rate, the interest rate banks pay the Federal Reserve Bank when they borrow money. U.S. #1577-78 commemorates the Centennial Convention of the American Bankers Association. The Fed operates with a great deal of autonomy. It does not rely on Congress for funding – operating expenses are collected from investment income and fees for its services. Although the Fed reports to Congress, it is legally free to make its own policy decisions. The Fed has promoted nationwide economic stability by working to keep interest rates low during recessions and letting them rise during periods of economic growth. Click here to read the text of the Federal Reserve Act. 6 Responses to "This Day in History… December 23, 1913"
Good article. However, the lack of a mention of President Andrew Jackson’s battle against Nicholas Biddle and the National Bank was glaring. Everyone have a Merry Christmas and a Happy whatever. The whole thing is a freaking mess right now! Great stamps though- really like the commerce-banking duo. If anyone is interested in a comparison of the Fed’s behavior between the Great Depression and the Great Recession, check out Eichengreen’s book, Hall of Mirrors. BEIGE BOOK is published by U S Fed , 8 times a year on current economic conditions. In 1985, Paul Cox , a Dow Jones reporter, was the first person who was granted permission to see THE BEIGE BOOK . Now, journalists and economic experts , have an access to he BEIGE BOOK which is considered economic indicator ! The Fed is the Lender of LAST RESORT to those institutions which cannot obtain credit from elsewhere and whose collapse can seriously harm the economy. It is interesting to note, that on September 16, 2008 The Fed offered $ 85 billion to prevent bankruptcy of international insurance giant A.I.G. The Federal Reserve profits were $ 100 billions in 2015. and out of this $ 97.7 were transferred to U.S. Treasury. Another important fact is that U.S.A. holds world`s largest stock of gold ( 8133 tons of gold worth $ 180 billions ). It is next to Germany which holds 3387 tons of gold. America`s FORT KNOX BULLION DEPOSITORY is impregnable vault with 4582 tons of gold . First gold bar shipments came in January 1937 to Fort Knox . 500 rail cars were used to transfer gold to vault and this gold was sent by REGISTERED MAIL and protected by U.S. POSTAL INSPECTION SERVICE. No member of public is allowed to enter Fort Knox vault, the only exception was on September 23, 1974 when a group of journalists were allowed inside escorted by Director of United States Mint Ms Mary Brooks and postal inspection service officials. Net worth of households is published by The Fed in a report titled FLOW OF FUNDS. Thank you MYSTIC for interesting history of the Fed .